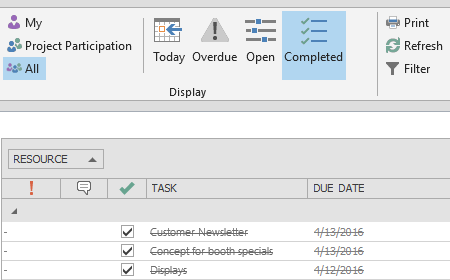 To create a new task, click in the Ribbon on the Home tab on New task. You will be automatically the responsible resource for this task. To further edit this task, click in the Ribbon on the Home tab on Edit. In the side panel on the right, you can now rename the task and add a description of the task. You can also set the estimated effort required for the task. A working day equals 8 hours by default. With the arrow next to working days, you can set whether you want to display the effort in working days, hours or minutes. A personal task, i.e. a task unrelated to a specific project, has to be assigned to a resource. If you aren’t in charge of the task yourself, you can assign the task to another resource. A click on the little arrow offers you a quick selection of frequently used resources, a click on the three dots opens the global address book. A task can only be assigned to one resource to guarantee clear responsibilities. You can set the time frame for the task (i.e. the start and end date), but you don’t have to. 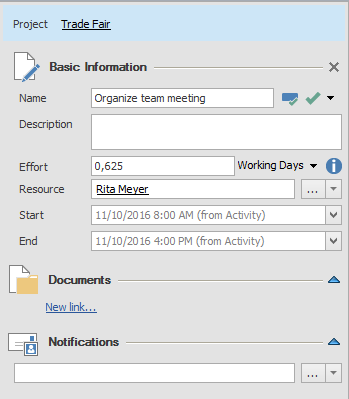 Click on New link… in the Documents area to add a document to the task. You will then see an overview of all documents that have been added to InLoox and that you have reading permissions for. You can also add a new document by clicking on New. Now you can select a new document from your computer or your file server. 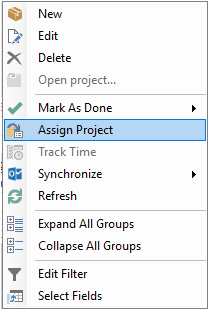 Click on the task in the task list that you want to assign to a project. The task is not supposed to be assigned to any other project yet. Click in the Ribbon on the Home tab on Assign Project. You will see a list of all projects that you have reading permissions for. Please select the regarding project and confirm with OK.
Alternatively, you can also find this command in the context menu. Right-click on the task that you want to assign. You will find Assign Project there, too. As soon as a task has been assigned to a project, there will be a note in the side panel on the right regarding the project. You can click onto the project name to get directly to the project. If the task has been assigned to a specific activity in the Gantt chart, the time frame of the activity will determine the start and end date of the task. You can change that manually, as long as task is performed within the time frame of the activity. Every InLoox user can determine in the user settings how and when he or she wants to be notified about upcoming tasks. In Outlook, click on the File tab, then under InLoox, select Options. In the Options dialog, click in the navigation pane on the left on User Settings, More Options. Now you can set how and if you want to be notified before the start and/or the end of your tasks. 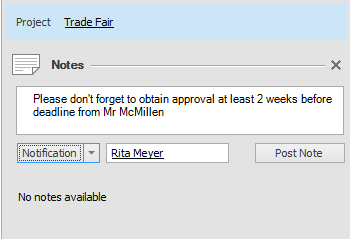 You can specify persons that you want to notify about new notes on the task. 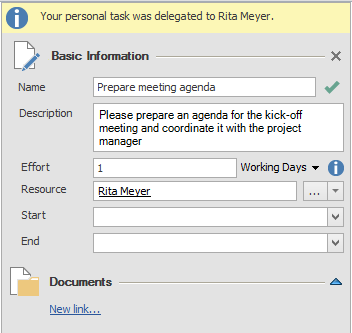 If a task is related to a project, you can notify other persons about changes on the task. Important The resource in charge of the task will be notified automatically if there are changes made to the task. The notification field is meant to notify other people such as the project manager. The arrow leads you to a quick selection of frequently used resourses, whereas clicking on the three dots opens the global address book. You can enter persons that you want to notify about new notes on the task. If you want to inform someone about it, click on the small arrow right to Notification for a quick selection of frequently used resources or click on Notification to open the global address book. Then click on Post Note. 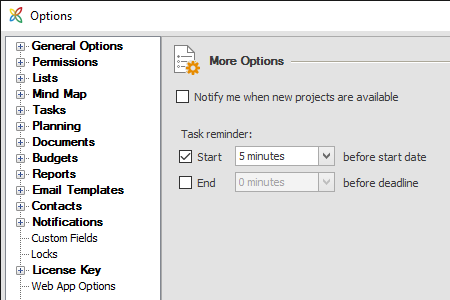 You can also add notes with notifications to tasks that are unrelated to a specific project. The InLoox Administrator can determine in the options how InLoox users are notified. 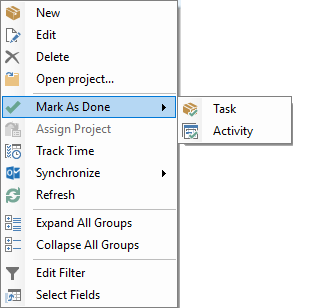 If you have added the Done column to your task list (the column with a green check), you can mark a task as done by activating the check box for this task in this column. Alternatively, you can also right-click on the task in the task list and select Mark As Done in the context menu. If the task is related to a project, you can determine whether you only want to mark the task as done or whether you want to also mark the activity in the project plan as done to which the task belongs. When you mark a task as done it will disappear from your task list if you have activated the filters Today, Overdue or Open and will be shown as a completed task. If the task is related to a specific project the completion of the task is reported back into the project and is taken into account in the calculation of the project progress. If you have activated notifications for the task the person/-s are notified about the completion of the task. If you as a project manager mark the task as done and you are not in charge of carrying out the task yourself, the resource assigned to task will be informed automatically. You can delete tasks by clicking on the task you want to delete in the list and then click in the Ribbon on the Home tab on the Delete button. You’ll also find this command in the context menu. You get to the context menu by right-clicking on the task that you want to delete. If you delete a task, the people for which you have added notifications will be informed about it. If you as a project manager delete a task for which another resource is in charge of, the resource will be informed. Warning Deleted tasks are removed permanently – you are not able to restore them. Tip If you want to delete several tasks at the same time, you can use Multi-Select. Press and hold the CTRL key on your keyboard and click on the tasks that you want to delete at the same time. Now select the Delete button in the Ribbon. Create, edit and delete tasks | InLoox 9 for Outlook • Copyright 1999-2019 © InLoox, Inc. All rights reserved.